8:00-08:20 - Meet your tour guide at suggested places around Old Quarter for Ha Long Bay. 12:30 - Embark at Tuan Chau Harbour, Ha Long City. Transferred by tender to The Viet Beauty Cruise. Greeted by crew members followed by welcome drinks, get cruise briefing and check in cabin. 14:50 – Drop anchor at Vung Vieng fishing village (Belong Bai Tu Long Bay), tender will take passengers to visit one of the largest and oldest fishing village on Ha Long bay, exploring the lives of local fishing villagers and then visiting the farm of pearls processing. 19:30: Gala dinner, then freely relax with other choices: Squid fishing or Karaoke or chatting & drinking to each other on sundeck. 7:00 – Breakfast with tea, coffee, cakes, fruit juice, milk, cereals. 7:45 - Visit Sung Sot amazing cave with millions of surprising stalactites and stalagmites – one of the biggest & most beautiful caves on Ha Long bay. 9:30 - Back to the cruise, check out room. Relax on board while it’s moving towards Hon Gai port. 12:00 – Crew say thanks to all. Passengers then get on bus back to Hanoi. 17:00 – Drop off at the hotel in Hanoi Old Quarter. · Pick up/drop off by air-conditioned bus. · Some local wine, fresh fruit on board in the afternoon. · Kayaking, entrance fees, activities on board. · Tips and others not clearly mentioned above. · Under 5 years old: Free of charge, sharing room with parents. · From 5 up to 9 years old charge 75%. · From 10 years old up: Charge adult price. 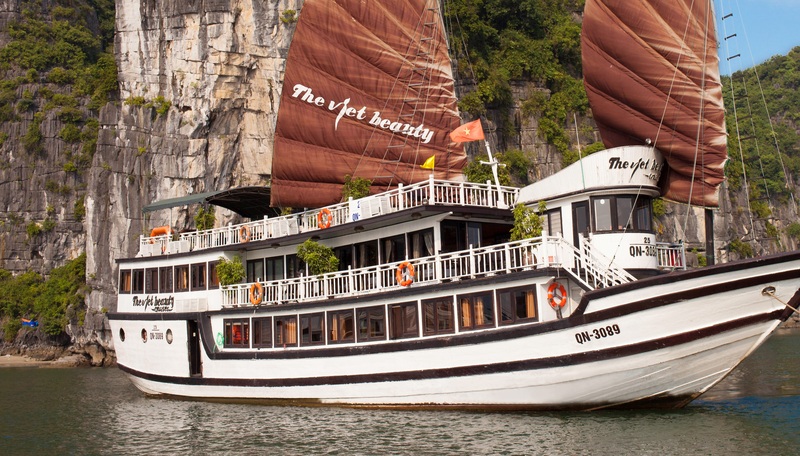 What do you think of Viet Beauty Cruise? "Beautiful boat, Great companions and Nice tour guide!"